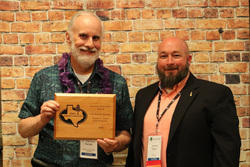 Dr. Kenneth Farrish received the Project Learning Tree Forestry Innovation Award during the Texas Forestry Association's annual convention held in October in Galveston. The award recognizes Farrish's efforts to develop and continually improve Stephen F. Austin State University's Division of Environmental Science senior seminar course that enhances student competencies in the professional workplace. NACOGDOCHES, Texas - The Texas Forestry Association presented Dr. Kenneth Farrish, Arnold Distinguished Professor and director of Stephen F. Austin State University's Division of Environmental Science, with the Project Learning Tree Forestry Innovation Award during the association's annual convention held in October at Moody Gardens in Galveston. "Dr. Farrish realized that graduates often lack certain skills that enable them to build successful, satisfying careers," said Misty Bowie, PLT co-coordinator. "That understanding of his student's needs and the needs of their future employers led him to develop and continually improve his senior seminar course." Noteworthy class activities include attending the Texas Association of Environmental Professionals' conference, professional networking and a business dining etiquette seminar. Writing résumé and cover letters, interview etiquette, presentation and interpersonal skills, and appropriate business attire also are addressed. "The course, which is required for seniors in the environmental science program, is experience-based, helping students develop skills that make them more well-rounded in their individual lives and build their self-confidence as they prepare for the transition to the workplace," Bowie said. "Positive feedback from the course has led administrators in the forestry program, as well as in other colleges on the SFA campus, to take steps to develop and implement similar programs for their respective fields."